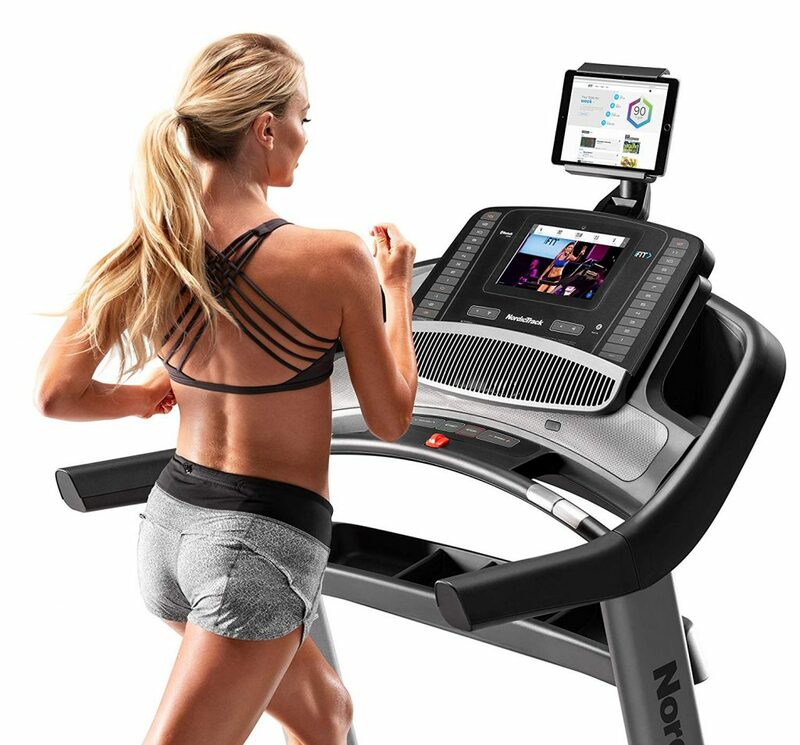 NordicTrack Commercial 1750 (NTL14119) is a high end treadmill with a powerful 3.75 chp commercial plus motor, a 22″ x 60″ commercial tread belt, a 10-inch high definition smart LCD display, Bluetooth compatibility, a very sturdy construction and a variety of user-friendly features. NordicTrack 1750 is an iFit Coach ready product and you’ll get an iFit membership that costs almost 400 dollars by itself free of charge for a year. That feels just like being a club member and having a personal trainer without needing to leave the comfort of your own home. The incline can be adjusted between 3 and 15 percent. 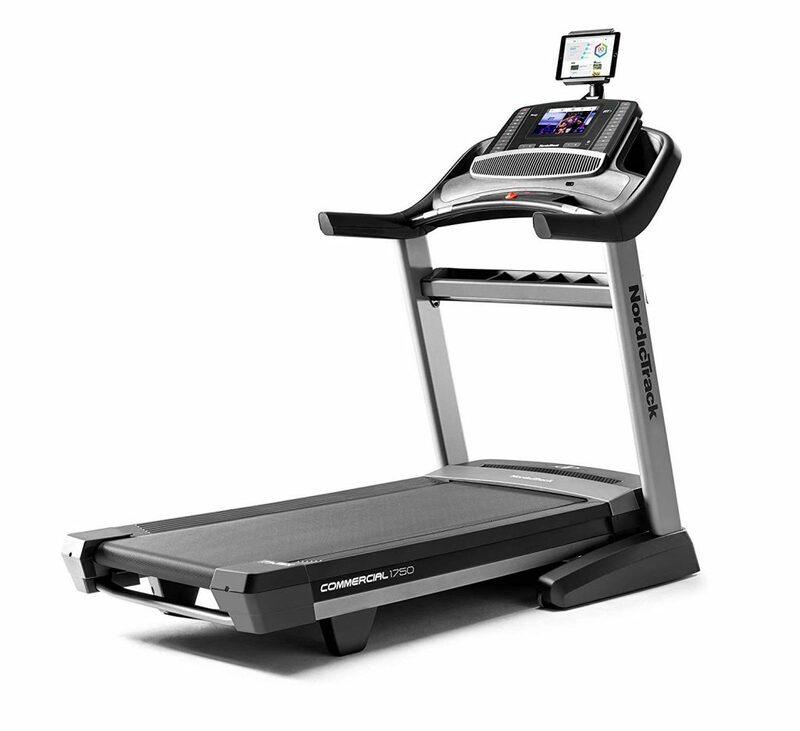 This NordicTrack treadmill has a large 22″ x 60″ commercial tread belt that you can walk, jog or run on comfortably. And you can hold the nicely padded comfy handles for balance. It has a very robust construction and a maximum of 300-pound user weight capacity. Despite being a heavy-duty treadmill with a premium look and feel, it has a compact foldable space saver design with the easy-lift assist that you can use to fold it easily and move on transport wheels to a convenient corner. It comes with the dual AutoBreeze workout fans with a variable speed to make you feel more comfortable during your exercise on warm days. You’ll find more than 16,000 on demand workouts by very experienced trainers, including calorie burning cardiovascular workouts to yoga poses for cooling down. You can work out in different parts of the world with the immersive experience of the live interactive controls. You can also benefit from the intense studio workouts with the speed and incline under the control of the coaches. The Nordic Track 1750 weighs 309 pounds and offers a user weight capacity of 300 pounds on its very sturdy frame. There is a large 10-inch HD smart display with many buttons around it and a tablet holder just above it to keep you distracted and entertained during your workout. So you can go for longer without getting bored. This treadmill is not all about iFit and you can use the preset routines or manually adjust your own settings for speed, time and more. It looks very sleek and modern with a premium look and feel, has a variety of user-friendly functions and options, has a solid construction, comes with the one-year iFit membership training feature that will most certainly motivate you. It will let you work out every day or whenever you want in the comfort of your home. With a commercial grade construction it can be used by different people in your house. And you shouldn’t encounter any issues in the short or long run with this low-maintenance treadmill. The Bluetooth compatibility will be useful for a lot of people. The global outdoors workouts will keep you both entertained and active. We do not hesitate to recommend this great quality treadmill to anyone with busy work or life schedules without much time to get to the gym, if they have the budget for it.